Pegasus World Cup (G1) day at Gulfstream Park featured excellent racing weather - cloudy skies, temperatures in the mid 70's, with a fast main track and firm turf. There were 7 stakes races on the undercard, 4 of which were gradedbefore an announced attendance of 16,400. An all-time Gulfstream handle record (not including Breeders' Cups) of $41.984 million was bet on the 12-race card. 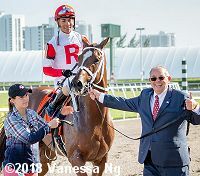 Gulfstream Park general manager Bill Badgett said, "The crowd, the entertainment, the fans and of course, our human and equine athletes made this an electric day from early morning into the evening. The Stronach Group continues to revolutionize the experience of attending a Thoroughbred race. We want to thank the wonderful fans and horsemen throughout the world. 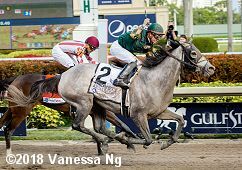 We feel the Pegasus World Cup Invitational will continue to grow, attract and engage even more of the world's best horses." A field of 9 older horses contested the $200,000 W.L. McKnight Handicap (G3) at 1 1/2 miles on the turf. 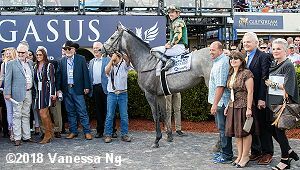 Canadian International (G1) winner Bullards Alley was sent off as the 2-1 favorite over 5-2 Gold Shield, 3rd in the Allen Jerkens Stakes, and 7-2 Oscar Nominated, 8th in the Red Smith Handicap (G3). Jockey Frankie Dettori sent 9-1 Infinite Wisdom to lead through fractions of 24.66, 50.35, 1:16.35, and 1:42.15 while pressed by 48-1 Mr Cub and stalked by Oscar Nominated and 25-1 Durocher. On the far turn, jockey Jose Ortiz sent Oscar Nominated 3 wide to gain the front through 10f in 2:06.04. Kept to task by Ortiz, Oscar Nominated easily held off late-running 6-1 Nessy by 1/2 a length in 2:30.08. It was just a nose back to favorite Bullards Alley third. Left: Oscar Nominated in the winner's circle. 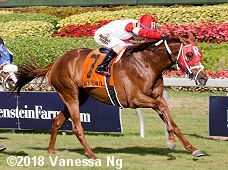 Winning owner Ken Ramsey said, "He's had had a lot of bad luck, getting second or third, but today Jose gave him the perfect ride and he was training well so we thought we had a big shot with him. These Kitten Joys like to run long, and this was 1 1/2. I think the distance with him is key and just being patient with him. And Jose fits him perfectly - he fits a lot of horses perfectly." Jockey Jose Ortiz added, "I wasn't expecting to break so good but wanted my horse to relax. The pace was a little slow, so he was a little keen the first half mile, but when I got him to relax and asked him to go, he did." Right: Third place finisher and beaten favorite Bullards Alley in the post parade. The Tim Glyshaw trainee improved his record to 6 wins, 5 seconds, and 7 thirds in 38 starts, earning $920,589 for owners Wayne Spalding and Faron McCubbins. Kicking off the stakes action on Pegasus day, the $200,000 La Prevoyante Handicap (G3) featured a field of 7 older fillies and mares going 1 1/2 miles around 3 turns of the turf course. 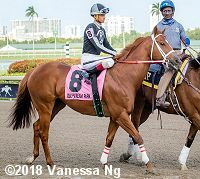 Dowager (G3) winner Apple Betty was sent off as the 9-10 favorite over 9-2 Beauly, 4th in the Flower Bowl (G1), and 5-1 Summersault, 4th in the Long Island Handicap (G3). Jockey Jose Ortiz sent 11-2 Daring Duchess to a clear lead through opening fractions of 23.68, 48.24, 1:13.00, 1:37.85, and 2:02.49 while stalked by Apple Betty and 23-1 Taralena. Entering the lane, jockey Javier Castellano sent 7-1 Texting, 5th early, out 3 wide for room and she rallied to win by 3/4 length over Daring Duchess in 2:27.88. It was 3 lengths back to Taralena third, while favorite Apple Betty faded to 6th. Left: Texting in the winner's circle. 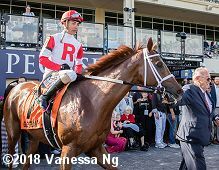 Winning trainer Chad Brown said, "She's a horse who has always been knocking on the door. It maybe took a little time for her to just get the right trip and come around a little bit more. We've obviously thought enough of her to try her in a stake before." 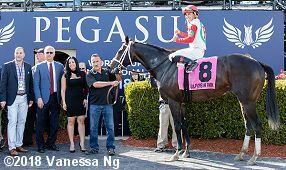 Jockey Javier Castellano added, "I had a beautiful trip, it was as good of a trip as any jockey would like to have. There were a few horses with good speed and we were able to settle around the first turn. I like what she did and I was very impressed with the way she finished in a 1 1/2. I basically enjoyed the ride." Right: Sixth place finisher and beaten favorite Apple Betty returns after the race. The Shug McGaughey trainee has a record of 5 wins, 1 second, and 4 thirds in 15 starts, earning $292,619 for owner Joseph Allen. The $175,000 Fred W. Hooper Stakes (G3) featured a field of 9 older horses going 1 mile around one turn of the main track. Kelso Handicap (G2) 4th place finisher Tommy Macho was the 2-1 favorite over 7-2 Beasley, 8th in the Cigar Mile (G1), and 4-1 Tale of Silence, 2nd in the City of Laurel Stakes. 20-1 Moves Like Ali and 13-2 First Growth dueled for the first 3/4 mile through fractions of 24.09 and 46.57 while stalked by Tommy Macho. Entering the stretch, Tommy Macho gained the lead through 3/4 in 1:10.79. Kept to task by Luis Saez, Tommy Macho held off late-running 15-1 Conquest Big E by 3/4 length in 1:36.10. It was a long 4 1/4 lengths back to Tale of Silence third. Left: Tommy Macho in the winner's circle. 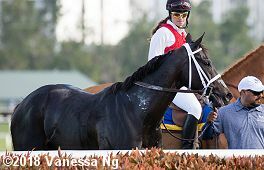 Winning trainer Todd Pletcher said, "He's a cool horse. I give the horse a lot of credit. He loves Gulfstream. He loves the one-turn mile. He's been awfully good to us. 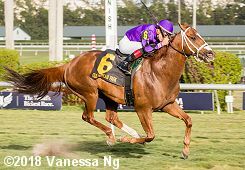 We'll probably skip the (Hal's Hope) and go to the (Gulfstream Park Mile)." Right: Tommy Macho heads back to the barn after the race. Winning jockey Luis Saez said, "That stretch run was really impressive. He was really ready for this race today. He broke well, we got a perfect position, and when we hit the stretch he just took off. I feel blessed and proud with how my season is going." 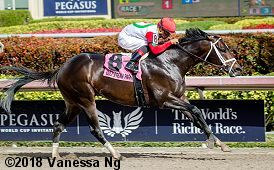 A field of 12 older fillies and mares contested the $175,000 Hurricane Bertie Stakes (G3) at 7 furlongs on the main track. 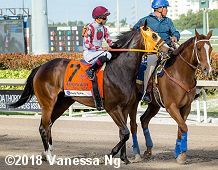 Rampart (G3) runner-up Curlin's Approval was sent off as the 8-5 favorite over 5-2 Marley's Freedom, 4th in the La Brea (G1), and 7-1 Moonlit Promise, winner of the Bessarabian (G2). Jockey Jose Ortiz sent 12-1 Apologynotaccepted to the lead exiting the chute through an opening quarter of 22.63 before 15-2 Spice Lady took over through a half in 45.72 pressed by 7-1 Moonlit Promise and stalekd by Curlin's Approval. Entering the lane, Moonlit Promise gained a short lead through 3/4 in 1:10.40 but tired late. 59-1 longshot Jordan's Henny, 11th early and 8 lengths off under Tyler Gaffalione, game through between horses and outfinished Curlin's Approval by 3/4 length in 1:23.68. It was another 3/4 length back to 19-1 Rich Mommy third. Left: Jordan's Henny in the winner's circle. Winning trainer Michael Tomlinson said, "Everyone discounted her, but this filly has a lot of class and we're just thrilled to death with the outcome of today. If you look at her form, she's got back class all the way. She ran very competitive here last year and she had just been working so well and so easy, doing everything we asked her to do." Jockey Tyler Gaffalione added, "The filly broke well today. She put herself in a real nice spot and was relaxed back there. When I picked her up at the 3/8 pole, she started giving me more down the lane, had a big stride and was all horse today. Hat's off to Mike. He did a great job and it's always a pleasure to ride for him. The owners really like this horse. They had a lot of confidence in her and were just hoping she showed up today." Right: Second place finisher and beaten favorite Curlin's Approval in the post parade. 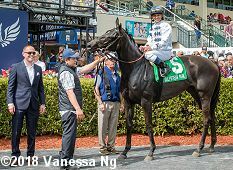 The Happy Alter trainee improved her record to 7 wins, 3 seconds, and 0 thirds in 16 starts, earning $543,243 for owners Alter's Racing Stable and Bridlewood Farm. 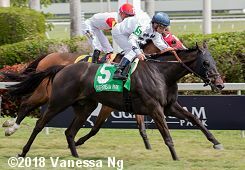 The $175,000 Ladies' Turf Sprint Stakes featured a field of 12 older fillies and mares sprinting 5 furlongs on the turf. Blue Bahia was the 5-2 favorite over 5-1 Code Warrior and 11-2 Girls Know Best. 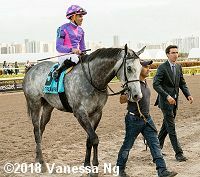 Jockey Javier Castellano sent Girls Know Best to the lead through fractions of 22.31 and 44.53 while pressed by Blue Bahia and stalked by 19-1 Just Talkin. in the stretch, Blue Bahia stumbled and faded to finish 10th, as Girls Know Best outfinished Just Talkin by 3/4 length in 56.45. It was a neck back to 12-1 Cherry Lodge third. Left: Girls Know Best in the winner's circle. Winning trainer Eddie Kenneally said, "Her record was phenomenal, she was five for ten before I claimed her. She had never run on grass and she's extremely quick. She had been running three quarters on the dirt and I felt like if she took to the grass at 5/8, she could be very nice, so we got lucky. We've claimed some bad horses in the past, but fortunately we got a good one this time." 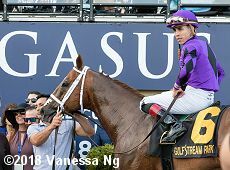 Jockey Javier Castellano added, "I had a perfect trip. I had the speed, I was inside on the rail, I used her enough to secure my spot and dictate the pace, go to the lead and blow the field away wire to wire." Right: Tenth place finisher and beaten favorite Blue Bahia pulled up after the race but walked off under her own power. 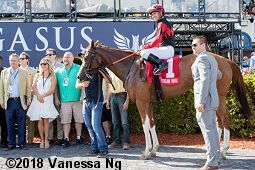 The Jason Servis trainee has a record of 8 wins, 2 seconds, and 1 third in 16 starts, earning $241,844 for owner-breeder Dennis Drazin. 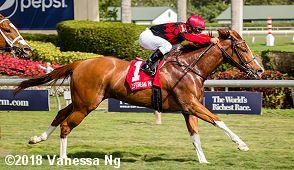 A field of 11 older horses went 5 furlongs on the turf in the $125,000 Gulfstream Park Turf Sprint Stakes. Pay Any Price was the 11-4 favorite over 3-1 Richard's Boy and 15-4 Rainbow Heir. 15-2 Successful Native set the early pace of 21.94 and 43.84 while pressed by Pay Any Price and stalked by Richard's Boy. 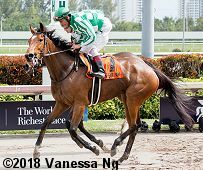 In the lane, Pay Any Price tired from the duel to finish 10th, as Rainbow Heir, 6th early under Irad Ortiz Jr., rallied to win by 2 lengths over 36-1 Oak Bluffs in 55.47. It was a neck back to Richard's Boy third. Left: Rainbow Heir in the winner's circle. 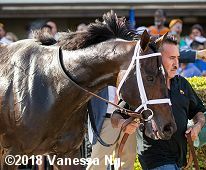 Winning trainer Jason Servis said, "They were going pretty quick, I was a little worried where we were placed early on, that maybe he wasn't going to fire. He's getting up there in years, but he's heading up to Ocala. This is his last race. I think he's a Breeders' Cup horse, I don't want him to go." Jockey Irad Ortiz Jr. added, "My horse has speed, he broke out well and put me in a good position. I was following Richard's Boy, and I was patient and just waited. Before I turned for home I knew I had some horse and man, I don't know how (Richard's Boy) will take off in the stretch, but I know I have some horse so when I asked him, he was there for me and we just flew by." Right: Eighth place finisher and beaten favorite Pay Any Price in the post parade. 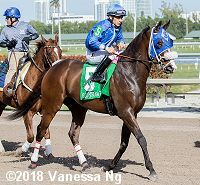 The Ralph Ziadie trainee has a record of 11 wins, 2 seconds, and 0 thirds in 19 starts, earning $366,293 for owners Matties Racing Stable and Averill Racing. Immediately before the Pegasus, 11 older fillies and mares contested the $125,000 South Beach Stakes at about 7 1/2 furlongs on the turf. Celestine was the 5-2 favorite over 3-1 Stormy Victoria and 5-1 Westit. 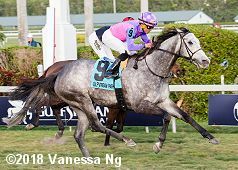 Jockey Jose Lezcano sent 51-1 Conquest Hardcandy to the lead first time by and he set fractions of 23.39, 46.91, and 1:10.69 while pressed by 10-1 Team of Teams and stalked by 10-1 Storm the Hill. In the stretch, the pacesetters tired as Stormy Victoria, last early under Joel Rosario, rallied 5 wide and outfinished Celestine by 3/4 length at the line in 1:29.03. It was 2 lengths back to 12-1 I'm Betty G third. Left: Stormy Victoria heads to the winner's circle. The Christophe Clement trainee improved her record to 6 wins, 4 seconds, and 3 thirds in 22 starts, earning $431,215 for owners Tango Uniform Racng and The Elkstone Group. 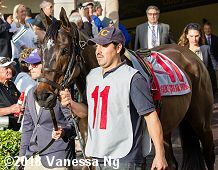 Right: Second place finisher and beaten favorite Celestine in the paddock before the race. The Christophe Clement trainee improved her record to 8 wins, 3 seconds, and 3 thirds in 19 starts, earning $1,143,155 for owner Moyglare Stud Farm.